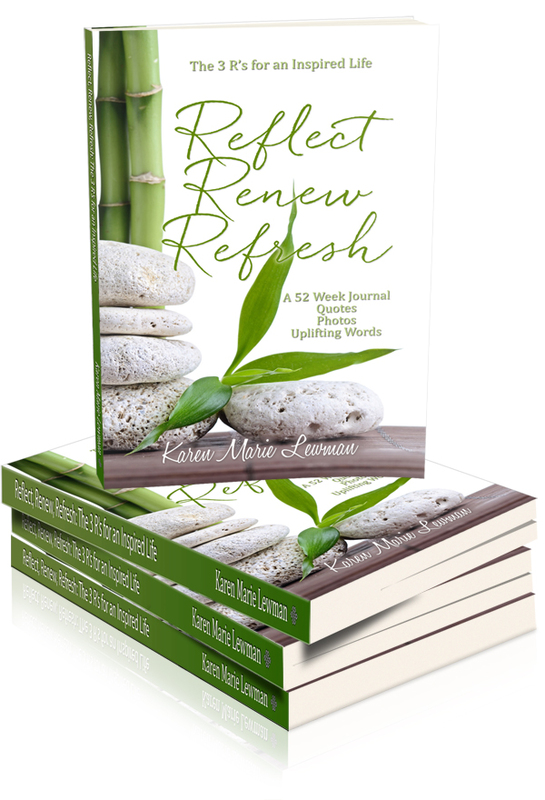 “Reflect, Renew, Refresh, The 3 R’s for an Inspired Life,” is a 52 week journal of quotes, uplifting words and a collection of my travel photos to enrich your Life. I created this guide from the daily notes of encouragement my husband gave me during my cancer recovery 13 years ago. They meant so much to me that I kept them in albums and knew I would one day create a book to share with others. Regardless of our current state of mind, we can always benefit from bursts of inspiration. Use “Reflect, Renew, Refresh” as your guide to enhance your well being, nourish your soul and improve your outlook on life. I have found that if we take the time to Reflect on positive influences and meaningful occurrences, we can Renew our spirit and Refresh our soul. Open “Reflect, Renew, Refresh” to the week and immerse yourself in the beauty of each page, finding comfort in the words and images. Then in the journal page for that week, write down your thoughts in each of the sections to “Reflect, Renew, Refresh” , stating how you intend to benefit from that week’s inspiration and how you will incorporate their meaning into your Life. Give thanks that you are taking the time for You! And know that I will be with you every step of the way, using my “Reflect, Renew, Refresh” journal on my Life’s journey. Please visit my author site to get a peak and to order yours today.